It’s DONE!! I have never painted so much in my entire life. If this is your very first time stopping by my blog, Hey there! I am so glad you are here. 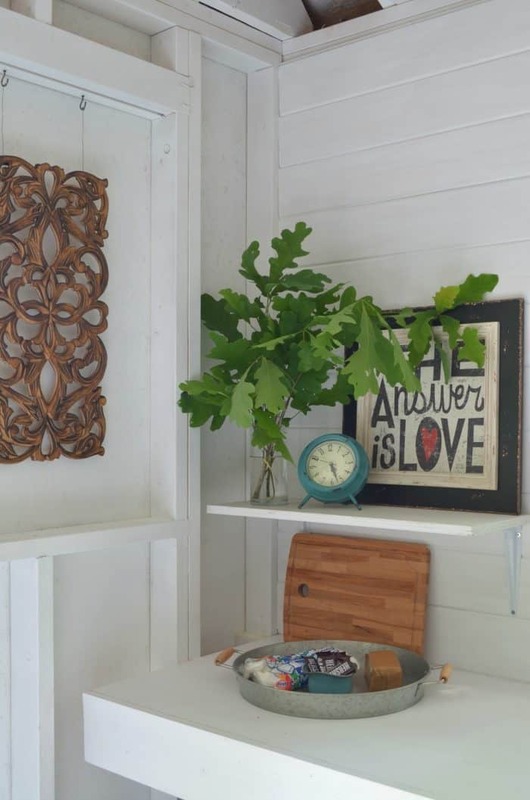 It’s One Room Challenge Shed Makeover Reveal day, so you picked a great day to visit. To catch everyone up to speed let me do a little summary. 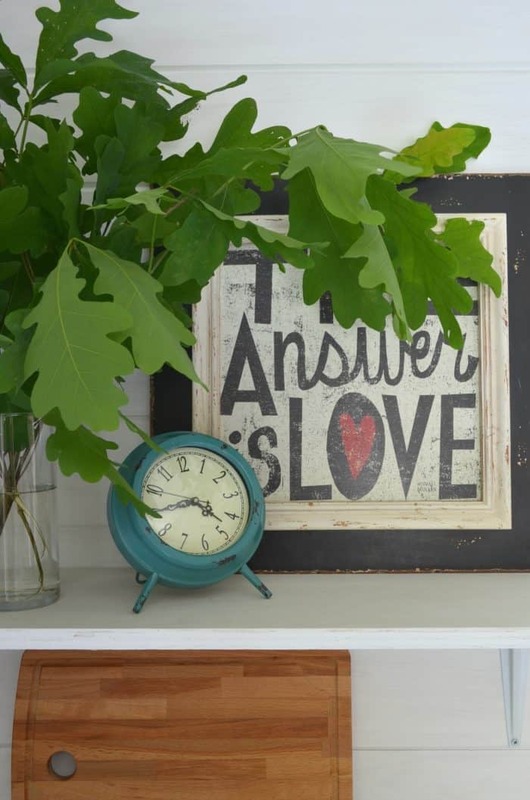 I am joining in with Linda at Calling it Home and lots of other talented designers and bloggers. Over the past 6 weeks we have been hard at work for one room makeover. Each week we have been updating on the room progress and today is the big reveal day. I’ve been torn as to what to call the shed now that it is isn’t really a traditional shed. 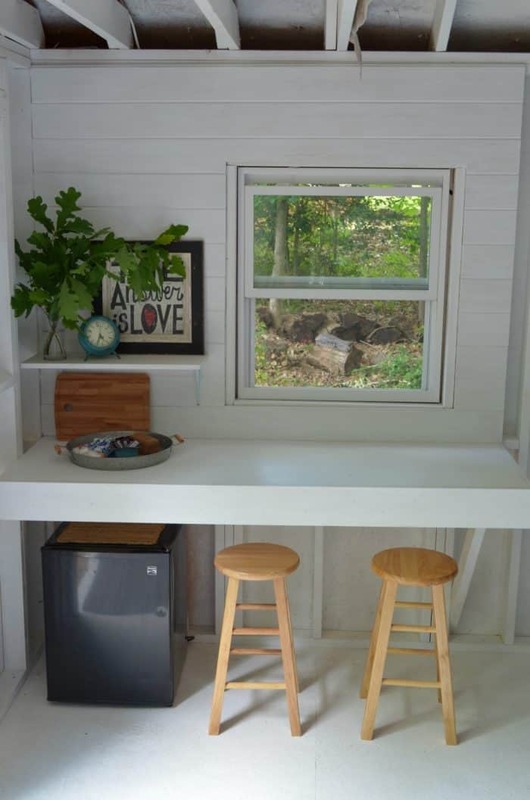 The she shed is super trendy but my family said it’s not just mine although I totally plan on using the new serving area as a desk to work on my blog! My son said it’s still the shed but now it’s THE Shed! I’m happy with that. I know you stopped by to see the makeover so let’s get to it! I am thrilled with the final results. How about a quick reminder of how it look before. 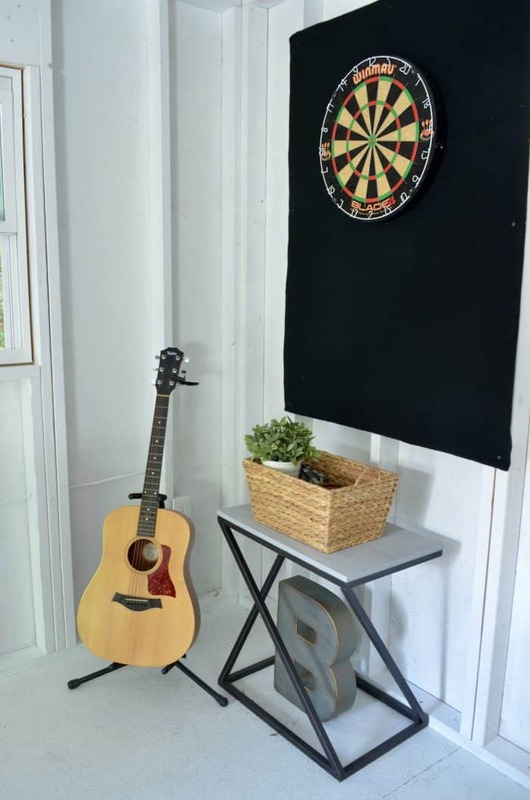 I kept the dart board where it was because it was already in the best location for safety reasons but I added a small table I found on clearance at Ross. It had a wood top that I painted. 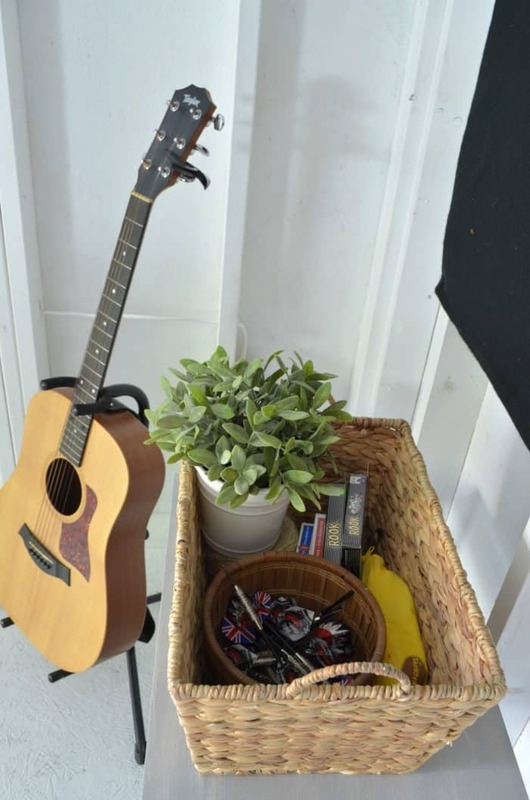 I used the basket for the darts and some extra games. The bench we added around the table is so awesome now. If we need more space we can always pull the table out for more seating. If you notice behind the bench (and the serving area) we added wood planking. 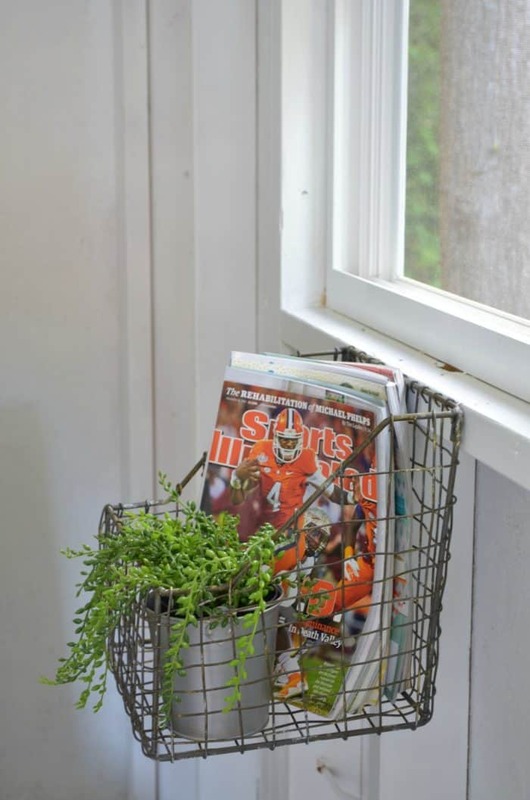 We did it the same as we did in our kitchen for last years one room challenge makeover. Here is a view without the table. My vintage school chalkboard got a layer of antique wax to cover up the orange wood. 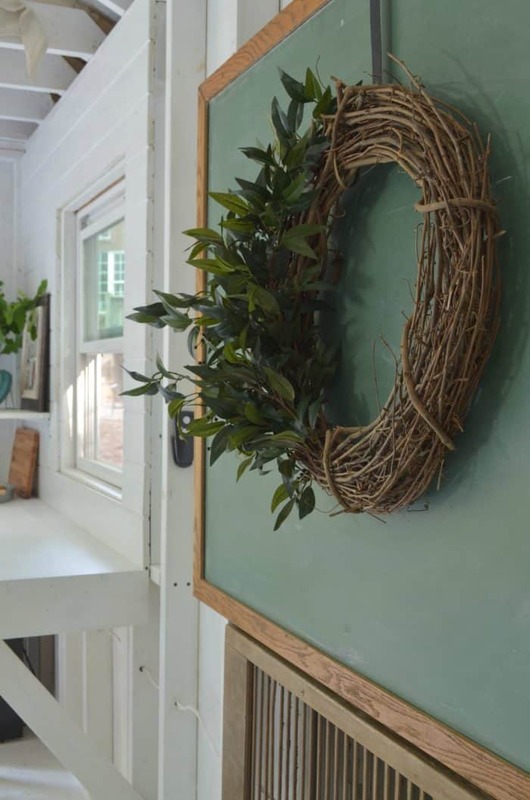 The shutter, which was on my in laws house when they first built it years ago, I used to hide wires but it gave some added texture to the space as well. The serving area also got a new look. Now instead of a pop up table we have a real serving area. Ray built it like he did the benches. I added the bar stools to make the space work double duty. When not being used as a serving table it can be a desk. I’ve already utilized that feature. The two loft areas above will still be used for storage. So my sister helped me cover it up with drop cloth. This was her idea and it turned out great. I grabbed the cheaper drop cloths at Walmart because they aren’t stiff. They are more fabric like in feel. Love the tent look it gives the space. I had planned to add plants to the deck but I didn’t get that part totally done yet. Ray needed to do some yard work so I decided to share the “porch” with you in a different post. I would like to give a shout out to Bedding Style for sending me the awesome throw blankets. 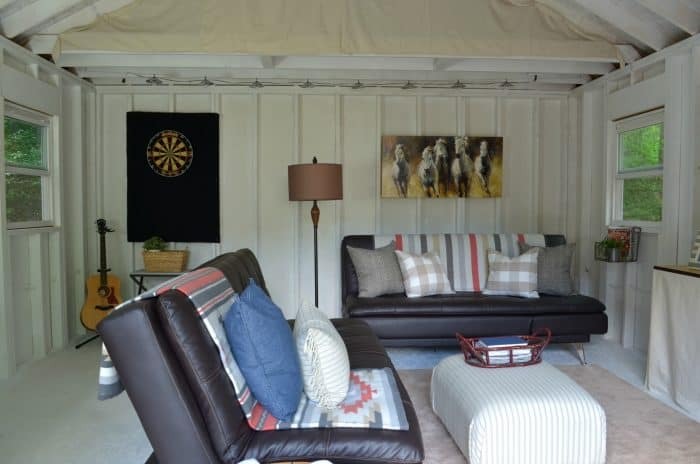 I worked with them on my bedroom makeover and they were super kind to give me the blankets for the shed makeover. Thanks to my sister Joy for all of her help. She completed a ORC living room makeover last spring so she knows what it takes to get this done. 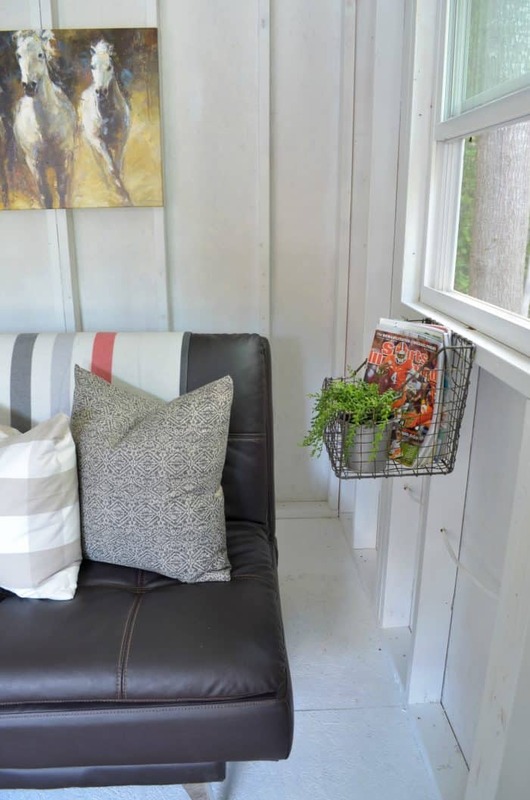 This shed makeover has lots of projects that can work in any space. I will post tutorials and how to’s on the blog so you can all be inspired. I’d love to have you on my email list so when I have those ready I can get them to you right away. I would love it if you would pin this photo to one of your favorite Pinterest boards. Thanks for helping me share my projects with the world. Love it so much! Great job friend!! omg, drooling!!!!! What a fund hang out!!!! AMAZING!!! Awww, thanks! We love it! Lovely, what a transformation! I particularly like the built-in dining nook!!!! So bright and spacious!!! It’s SO SUPER duper fun Sonya! I just love it!!! 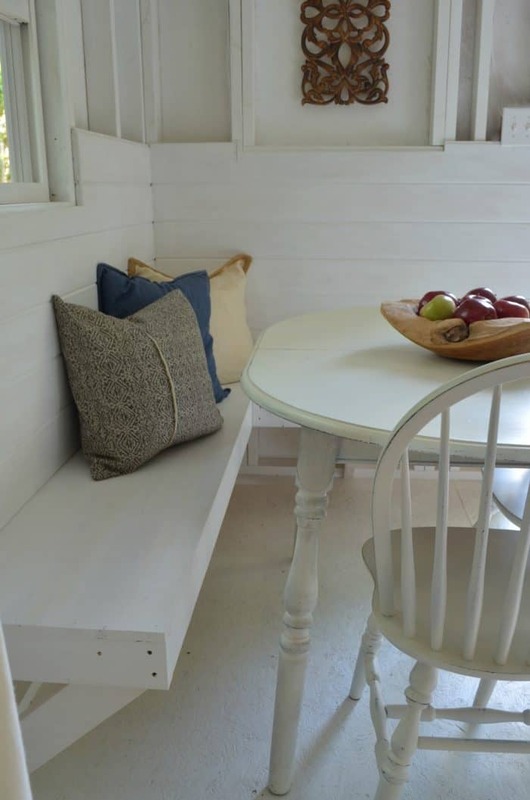 What a fun, casual space for you and your family to enjoy! Great job! Now this is a HUGE transformation! 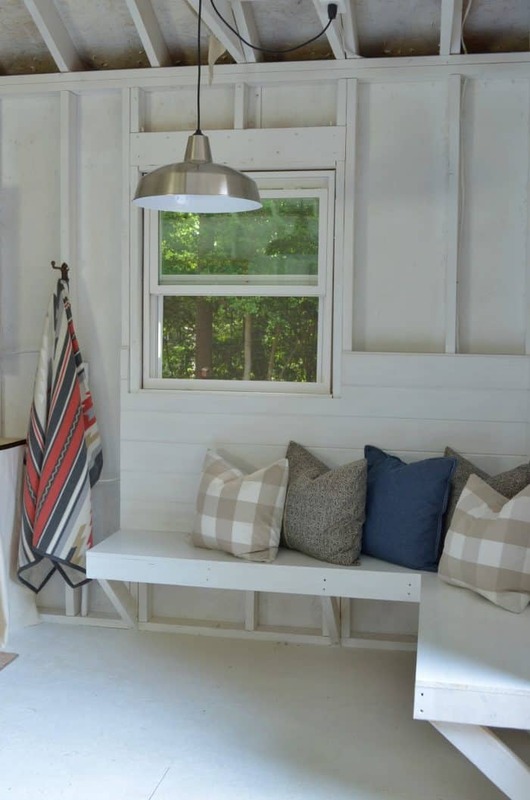 I love the use of the fabric over the loft storage area. It adds a lot of texture to the space. Perhaps it should be referred to as the party shed, because how could you help doing anything else in that space! Sonya! That is one amazing transformation! 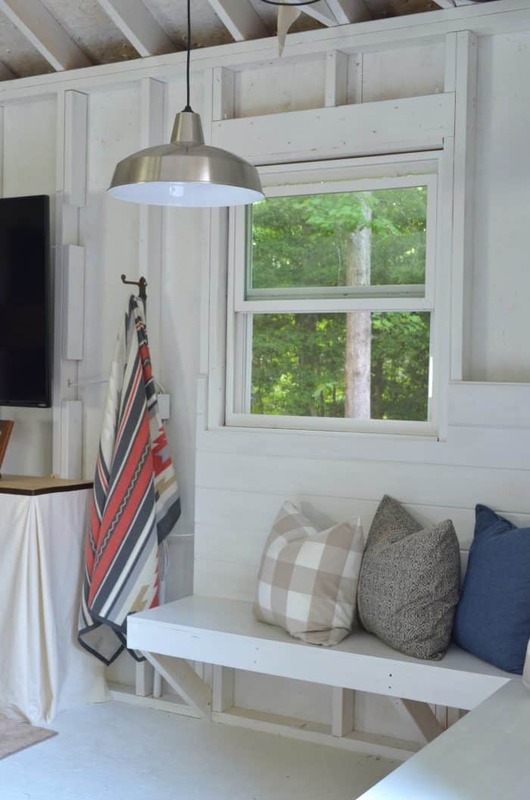 I love the clean crisp look to your “we” shed and all the built ins are awesome. Well done! I LOVE it! Such a fun rec space! I love that you madeover your shed!! It’s a really cool little hangout space now. Nicely done. It looks awesome!! Love the built in desk and seating area. The white paint did wonders and pulled it all together!! You are so talented, I think everything looks mahvalous! I wish I could do this, however I am an old lady of 81 yrs. I wish I could still do these kinds of projects. 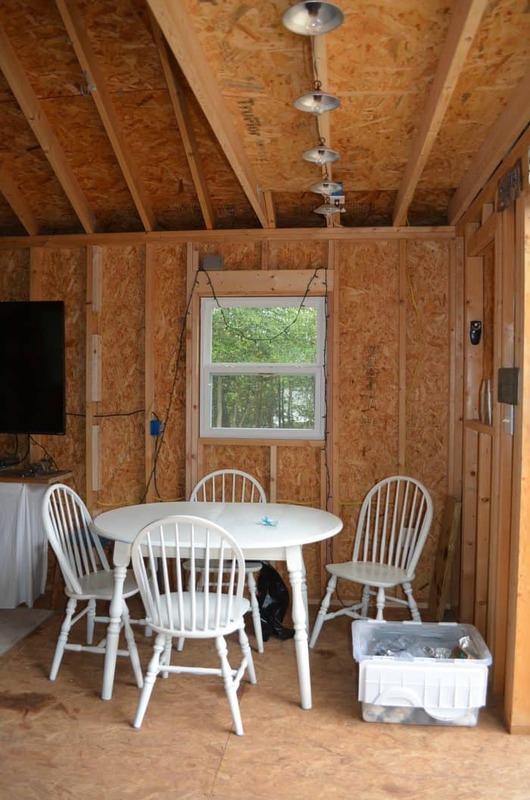 Your son is right, it is not THE shed. Everyone is going to want one, not just the she’s. I thought it was super cute from your Instagram pic but now I’ve seen the Befores too, it’s even better! Such a huge transformation, and all the little touches are great. Love the bench. Great work! Wow you did a lot and it looks awesome! I bought the string lights last summer at Home Depot from the outdoor patio section. so fantastic sonya! 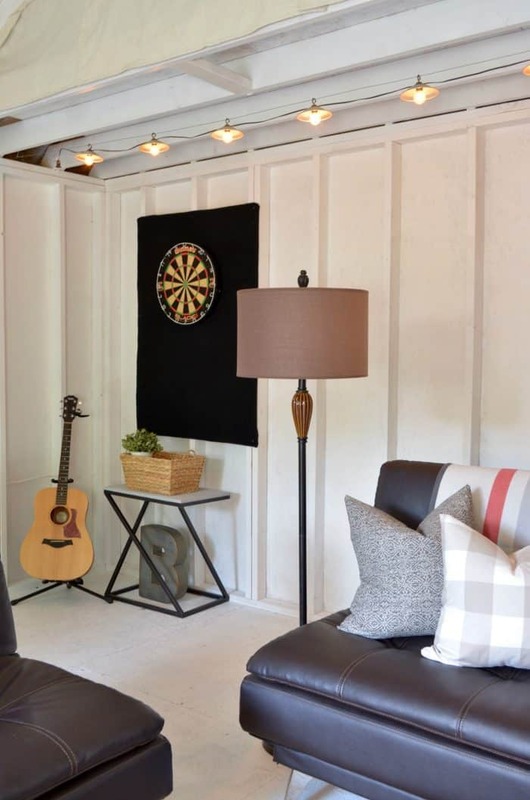 we have a huge loft area above our garage like this and one day we would love to turn it into a kid lounge! That looks awesome!!! what a great spot to relax in! What??!!! THE COOLEST SHED EVER! Great job Sonya, I am certain this is a favorite hang-out from now on! Congrats and CHEERS to us for another room done! DANG! 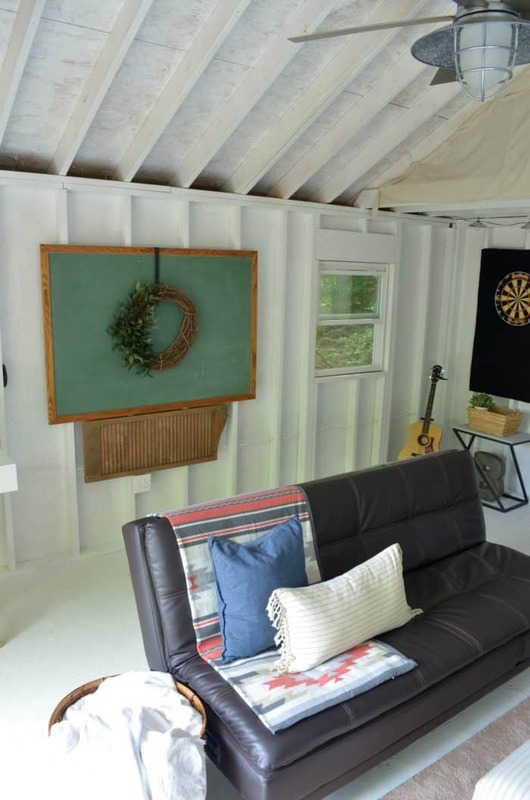 I have only seen shed makeovers on HGTV and I am simply ah-mazed at what you just did. I need a shed now! 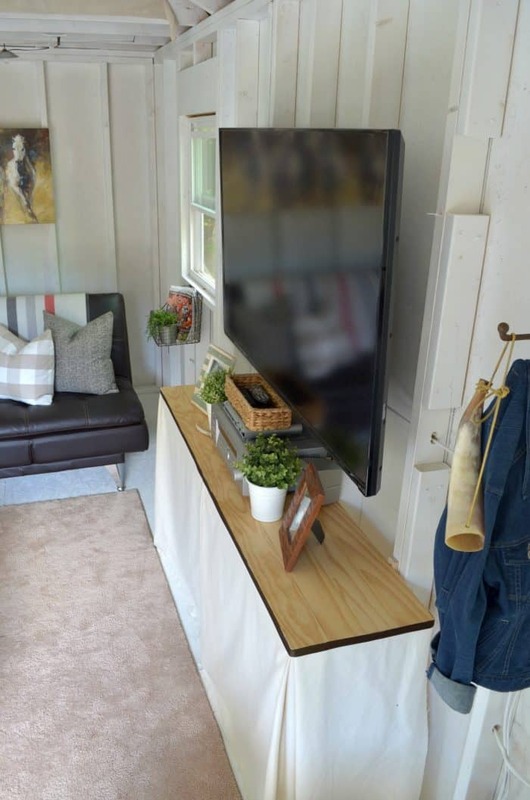 This is such a creative use of space. 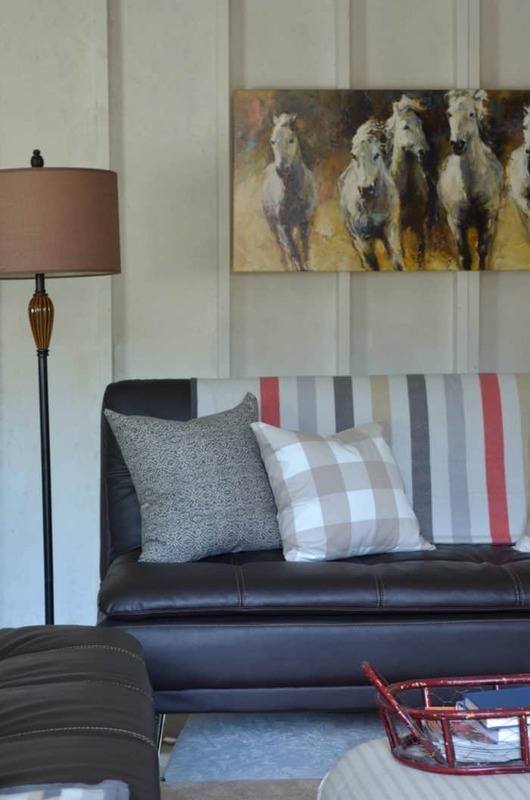 I love that it leans slightly more masculine, but still feels fresh and bright with the dark leather sofas against the white walls. 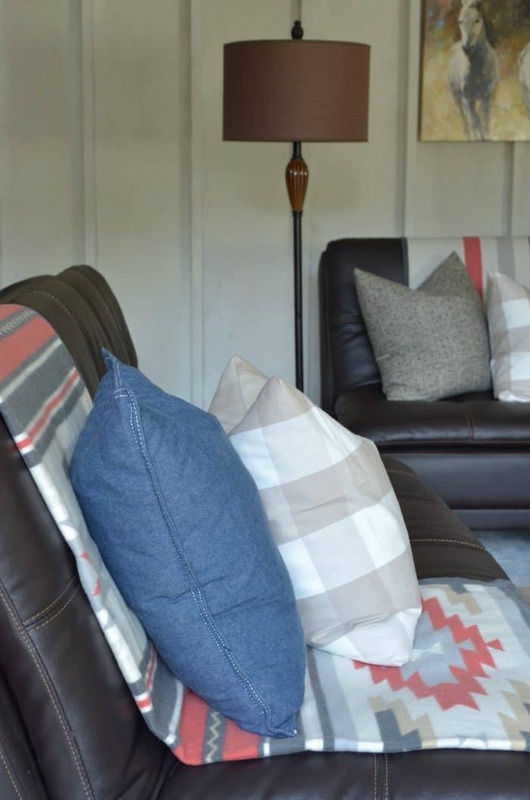 The throws are amazing- love the light fixtures and patterns of the textiles. I love this! And I found it at just the right time. My son, recently graduated from college with a job and everything(! ), has moved into his first apartment and I’ve had the hardest time coming up with inspiration for a young mans apartment that wasn’t too feminine. Your ideas here are just the inspiration I was looking for. Thanks so much for sharing. It turned out so awesome! What a fun space! And that really must have been a LOT of painting! Great work! I am SO jealous! 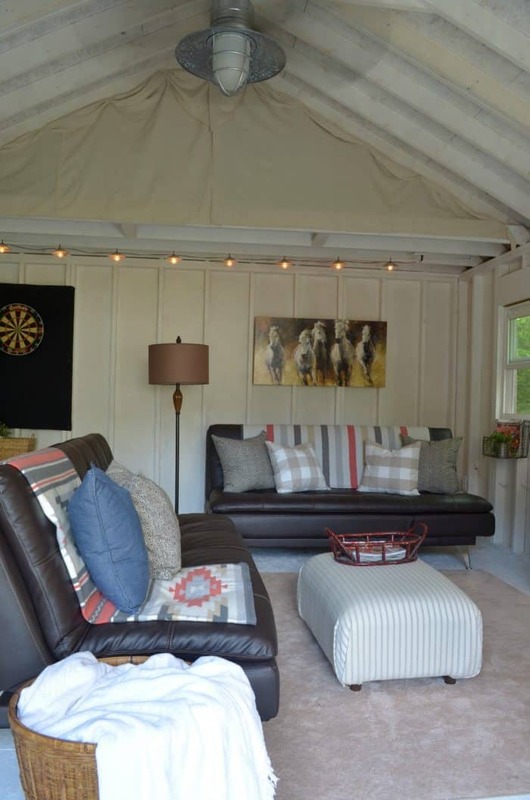 I really want a she shed! Beautiful! 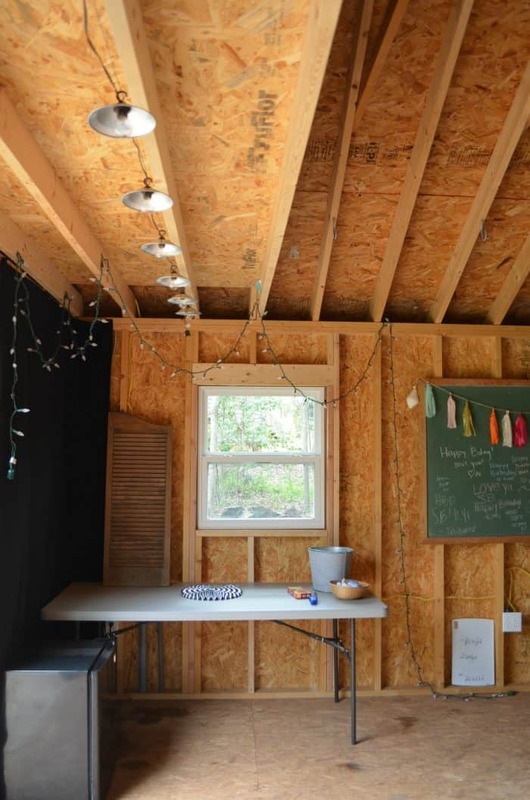 Hard to believe this space started as a shed. You did an amazing job creating a lovely hangout! So fun!! EEK!!! This is so incredible! I have such shed envy now! I totally wish we lived on more than a postage stamp so I could have a shed and totally recreate everything you’ve done here. This is absolutely amazing! Wonder if the HOA would mind if I had a shed that took over the entire backyard. Hmmmm….. Congrats! That is the pretties shed I’ve ever seen. You did a wonderful job with this space. Looks like a wonderful area to hang out with family and friends. Oh. My. Goshhhh. You should rent this out. I’d live here in a heartbeat. It turned out so nice! You really had some vision for this space and I can imagine that it took A LOT of time. Good job! Oh you are so lucky! I have been wanting a she-shed for a couple of years. Someday dreams. What a great bonus space! I love the crisp white paint. It looks so fresh and clean! Just fabulous! This is awesome! 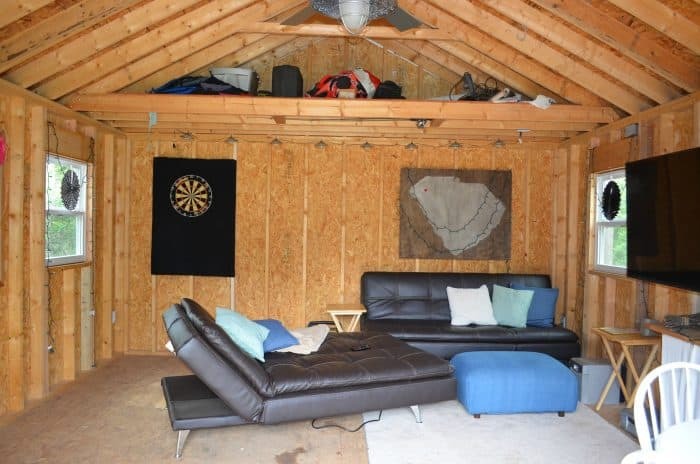 How do you make it without insulation in the shed? I’m wanting to convert ours to my office/studio but wondering if I need to insulate. I love in the south so humidity is a problem as well. Any advice would be lovely! Ours is not quite as big as this one. There are certain times when it’s too hot or too cold but all in all we are fine without the insulation. We have a ceiling fan and a tabletop fan for summer and we have used a small portable heater in the winter if we are having an event. We have 4 windows, and our shed is tucked under trees. We also live in the south. 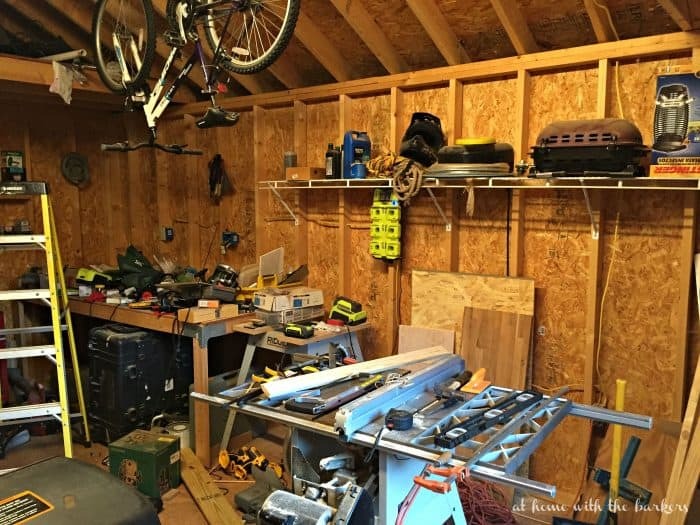 What is the size of your shed?? Awesome, you will love it. Our shed is 16 x 20. I stapled it! It has held up great. 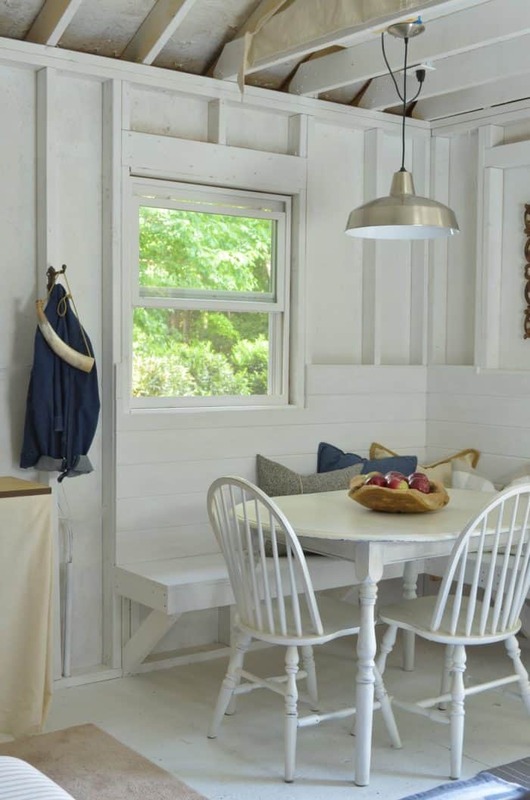 Love the built ins and open space. 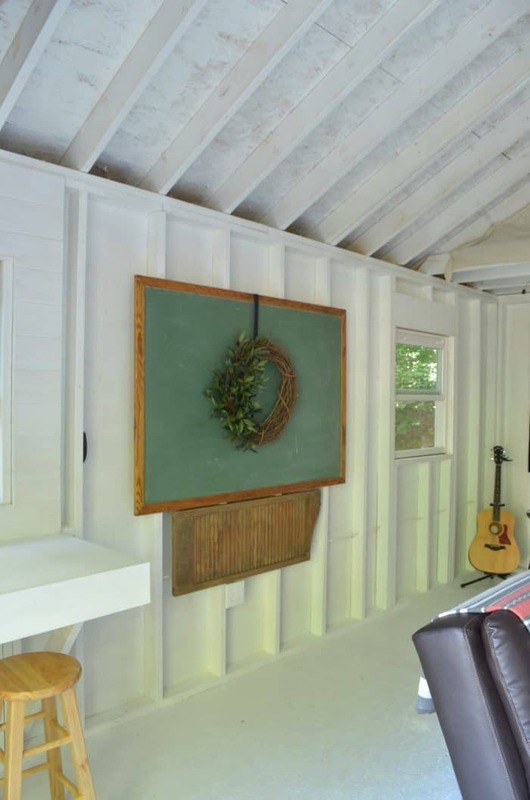 Did you consider insulation/wallboard? I bet it would have been easier then painting was!! Love your shed. You’re right, could have been easier but I wanted the open look plus the paint was cheaper.